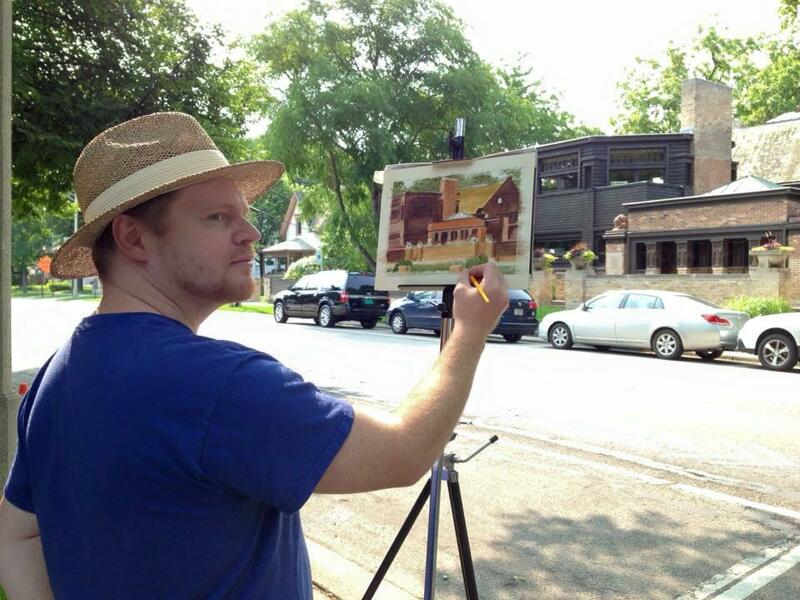 Spotlight Sunday is a series of interviews designed to introduce and highlight Chicago Urban Sketchers individually. Now that our chapter has reached nearly 500 members it has become more of a challenge to meet every member in person and have a conversation. These posts concentrate on individuals and speak in their own words and sketches. Hi Ted, thanks so much for taking the time to talk and to tell our group a little bit about yourself! My friend Ginny, a member of my early-morning sketching & plein air group, recommended USK Chicago to me. She was correct, it was right up my alley! Did you sketch before finding USk Chicago? If so, when did you start sketching? Yes, as a kid, I was very interested in drawing, comic books, science fiction & fantasy illustration, computers - all that stuff predicted my future career. Life Drawing was my favorite part of art school - where I could see my skills increasing dramatically. Sketching outside of sessions keeps me in practice. 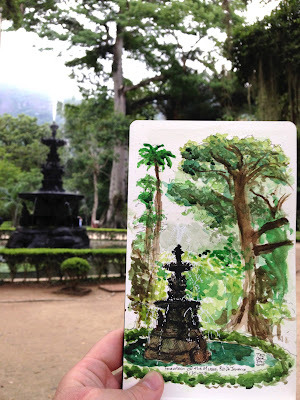 My favorite artists have done a lot of sketching ‘in the wild’. I’ve been following their example. Can you tell us a little bit about your career as an animator? Does urban sketching ever have an impact on your day job? If so, how? I have been working as a 3D Character Animator in the games industry since 1999. I use a combination of animation skills and specialized software, including 3DS Max, Maya, and Motionbuilder, to create the motion for people, monsters, animals, and robots for video games. I believe an artist’s career is as much about what is done outside of work hours to become a better artist as it is about what is done in the studio. I like to draw on the bus, I have a weekly plein air group, I do life drawing & life sculpture, and I like to go out and explore areas with my camera. Most recently, I explored Chinatown before people filled the sidewalks for the day. I work on portrait & house portrait commissions during my lunch hour and I make my plein air paintings available for sale on my site. I highly respect the Disney Animators that established my industry’s Principles and actively practiced life drawing and plein air painting as part of their job. They are my role models. That, and my love for drawing, painting, & animation, motivate me. Building my skills of observation, through practice like Urban Sketching, makes me a better animator & artist. You are also a member of the Plein Air Painters of Chicago group and many of your urban sketches can also be considered plein air paintings. There is real neat crossover between our two groups, and we’ve personally talked about this before. In your experience, what distinguishes urban sketching from plein air painting, and, having been a member of both groups, are there any specific skills or lessons you have learned from one group that can apply to the other? Both groups are about direct observation, drawing and painting on-location. I find them more similar than different. I suspect that my own work will organically combine elements of each the more I do of both! 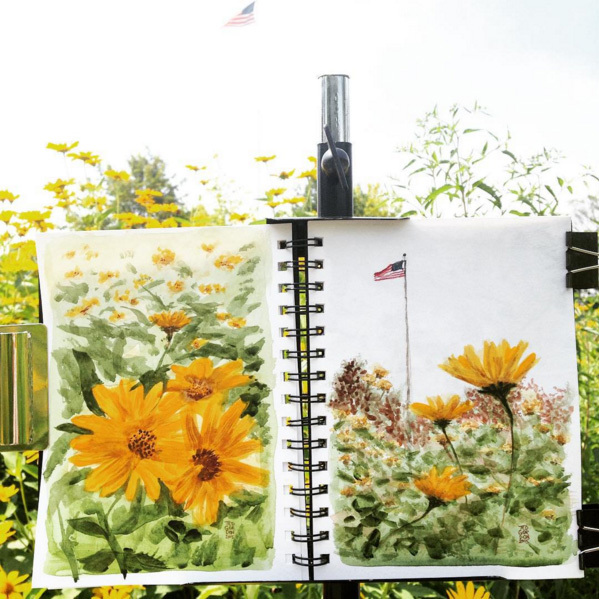 Is there a specific subject matter you are particularly drawn to or inspired to sketch? I like to do portrait & house portrait commissions. When I’m out and about, I am attracted to figures and architecture ‘in the wild’ too. What is your favorite medium to sketch with? I’ve been carrying a fountain pen, a ballpoint & watercolors. For precision and speed, I prefer ballpoint. For even faster, but looser, I prefer the fountain pen. If I have more time, I like to add watercolor washes. Are there any Urban Sketchers who inspire your own work? I’m a big Don Colley fan. He shows what a life of regular practice can do. His videos, sketching in ink were so exciting to find. I love the variety of work that USK Chicago and the international group share. Everyone has inspirational work in them. You will also be an instructor at this year’s Chicago Sketch Seminar for the second year in a row. What are you most looking forward to about this year’s Seminar? I’m looking forward to seeing all the new sketches my students will make, the new location, and the other instructors’ classes! Do you have any websites, blogs or social media accounts where people can see more of your work? Please contact me through http://www.tedgordonart.com/contact/ to inquire about commissioning original portraits & house portraits. You can find examples of my animation here: www.MotionImpossible.com Also, visit a Dave&Busters, movie theater, or amusement park near you and play Jurassic Park Arcade! I loved animating those dinosaurs!